TP-Link are really upping their game these days. They are moving hard and fast into the world of MU-MIMO wifi, and their latest release into this exciting new wireless world, is the Archer C3150. The TP-Link Archer A3167 doesn’t quite have the same ‘marketing ring’ as A3150 does it? So that’s why it’s been named the C3150….Well, that’s our guess anyway! Combining 4-Stream and NitroQAM together provides up to 25% improved Wi-Fi throughput overall (compared to similar spec’d routers without 4-stream/NitroQAM). 4-stream is the technology that allows 4 streams to be available to users on each of its two bands (2.4 & 5GHz). NitroQAM is the processing tech that helps make it all happen! Multiple User MIMO gives MIMO technology to up to 4 users at the same time. MIMO has been around since the days of Wireless N.
MIMO (Single) was able to take wifi signals that had been reflected or absorbed around the home, and optimize the signals (at the endpoint) to be more or less what they were when they were transmitted by the source (by the client or router). Yes, we know this is a very basic explanation! In a nutshell – MU-MIMO facilitates up to 4 users simultaneous and independent communication of others on that particular band, helping to speed up throughput for each wireless client. Better this than each client waiting their turn to ‘talk’ over the wifi. 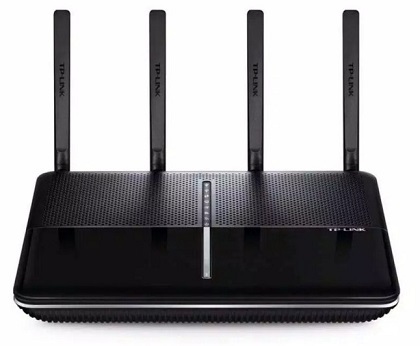 Note that TP-Link have stated that MU-MIMO will be available via a future firmware update – so it’s not out of the box. Although you are free to place devices on any band you so desire, the Archer C3150 has built in Smart Connect technology that can automatically place devices onto the band optimal for your network. With its dual core 1.4GHz CPU (along with 5 & 2.4Ghz co-processors), there is more than enough power available to cope with multi-tasking. TP-Link like to call it “XStream”. There’s 2 posts on board, and one of them is USB 3.0. Use this one for sharing media around the home! Beamforming increases coverage, and reliability to boot. It takes an omni-directional signal – which is broadcast in all directions, at all times, and shapes it to target clients as and when they need it. By doing this, it means that the wifi beamwidth is aimed towards the clients, which stretches out the distance that clients can roam, further than before. Have an extra 2 networks for your guests to connect to. Keep your own private network safe, but let visitors get to the Internet without your private info being compromised. One guest network is available on 5GHz, and the other on the 2.4GHz band. Having a guest network on each band means it is highly unlikely that a visitor is not compatible with your guest network! Quality of Service basically streamlines your network. It does this by ensuring that certain devices, and/or services that clients use, are prioritized over others. The last thing you want is to be streaming TV over the Internet and suffering unnecessary dropouts and pixilation because someone else on your network is downloading a movie or moving files to/from Dropbox (just as an example). Configure the QoS option to stop this. There are 4 LAN ports on board (along with a WAN port), each of them 1Gbps. If you can easily plug devices into your router, rather than using wifi, then we heartily recommend doing so. This is especially the case with gaming consoles/PCs or boxes that stream video over the Internet. It’s possible to manage who uses the C3150 and when. Within the Parental Controls menu, you can give access permissions as you see fit. This is a good way to make sure the kids are sleeping in bed, instead of playing games online, or surfing YouTube! Using either PPTP or OpenVPN, you can securely access your home network remotely. This is particularly useful if you have a USB drive plugged into the C3150 and you need to grab a file off it. Or vice-versa. If the blinking lights become annoying, you can switch off the LED lights. Same goes for the Wi-Fi.